The eXist-db Basic Installation article describes how to install and start eXist-db for basic usage. This article explains more advanced methods of installing and running eXist, for instance for a headless (no GUI) system, running it as a service, etc. Instead of manually running the eXist-db server in a shell window, you can run it as a background service which is automatically launched during system start-up. This can be convenient, especially for servers. eXist-db continues to run even after users have logged off. eXist-db comes with pre-configured scripts that use YAJSW (Yet Another Java Service Wrapper) to handle the setup procedure. The scripts for this are contained in the directory tools/yajsw. 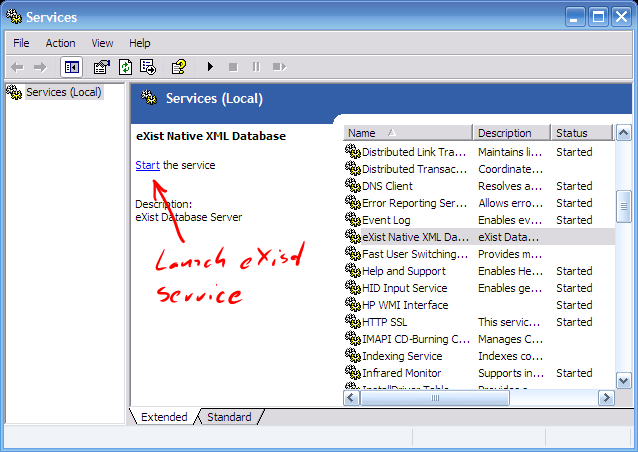 Choose Install eXist-db as Service from the eXist-db's system tray application. Choose Install eXist-db as Service from eXist-db's entry in the Windows start menu. Run tools/yajsw/bin/installService.bat from the command line. Installing eXist-db as a service on Windows requires full administrator rights. The scripts for running eXist-db as a service for Unix and Linux based system (among which MacOS)can be found in the tools/yajsw/bin/ sub-directory. This works for MacOS and many Linux distributions. If your system supports systemd you can run the service wrapper as a non-privileged user. You will be notified on choosing systemd non-privileged when running the service wrapper installer and uninstaller. Support for additional platforms can be bootstrapped by looking at templates in the tools/yajsw/templates sub-directory. Consult the YAJSW documentation for more information. Included in the distribution are a number of useful .sh (Unix Shell) and .bat (DOS batch) programs located in the bin sub-directory. Their names speak for themselves. However, if you find that programs do not launch, you can try to manually launch them on the command-line without the scripting wrapper. This often provides useful debugging information. Starts the included Jetty web server at port 8080. eXist runs as a web application, located at http://localhost:8080/exist/. Closes the running instance of eXist. If eXist has been started with startup.sh, calling shutdown.sh will also stop the Jetty web server. Otherwise, only the database is stopped by this call (since eXist has no control over the environment in which it is running). You should always call shutdown before killing the server process. Launches eXist as a stand-alone server process. In this setup, eXist is only accessible through the XMLRPC and the built-in HTTP interface.